We are a leading Manufacturer of batching plant silo, belt conveyor, screw conveyor, slat & drag chain conveyor and bucket elevator from Hyderabad, India. We provide an exclusive range of silo that can be availed at industry leading prices and also in Customized specifications. Our range of silo is known for its reliability, ruggedness and durable Finish standards. Belt Conveyors are used in Packing Department, Soap pellet feeding, Powder feeding in Hopper /reactor vessels Loading - Unloading material from Godown / Truck. 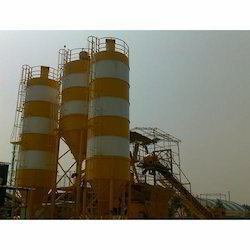 It is also most commonly used in Ceramic / Cement Industry/Thermal power Projects. Belt Conveyors are available in Natural / Synthetic Rubbers Belt in 3 ply to 6 ply depend upon applications. Our Range of belt widths is 300 mm to 1800 mm. With a capacity of .5 TPH to 300 TPH. 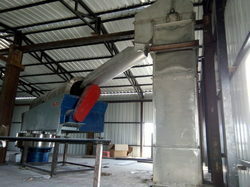 We are dealing in Screw Conveyor and our product is made up of good quality. Screw ConveyorScrew Conveyors made of SS304 / SS316 or M.S Contact Parts. 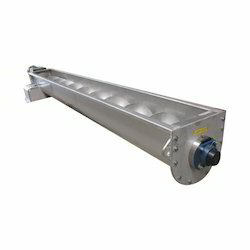 Most of this conveyor useful where total close material handling is require to reduce chances of contamination.This conveyor is having Blades ( Flights ) mounted on Hollow pipe shaft and shaft is connected to direct Gear Motor or with sprockets, Fights are totally covers with shell made of circular or Trough type. Our range of product capacity around 0 .2 TPH to 15 TPH. 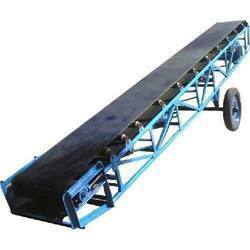 We are dealing in Slat & Drag Chain Conveyor and our product is made up of good quality. 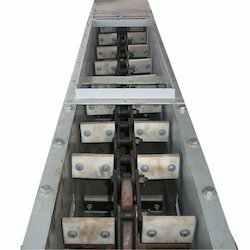 This conveyor is available in Link Slats chain Conveyors made of SS304 M.S. Conveyor is running at speed between 1 mtrs/ min. to 3 mtrs/min. We are determined to provide excellent quality material to our clients as per their requirements and are rendering Belt/Chain Bucket Elevators, which is manufactured using M.S., S.S. plastics or Combination. These bucket elevators are appropriate for small lump size, granular, powder and Abrasive material. Also, this bucket elevator is used in for handling material such as cements, Ceramic powder, fertilizers, coal, soda ash, limestone, ores and minerals, plastic pallets, etc.